We're Not Sure Why Copycat Dramas Manifest and A Million Little Things Exist, but They Definitely Do! Unfortunately for viewers, those who remember the TV past are condemned to repeat it… and repeat it… and repeat it. 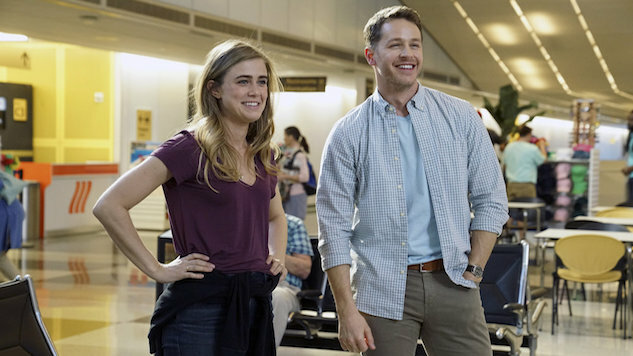 And so, in addition to the plethora of reboots, revivals and remakes peppering the TV landscape this season, we also have NBC’s Manifest and ABC’s A Million Little Things. As the saying goes, I liked these shows the first time around—when they were called Lost and This Is Us. Manifest is Lost in reverse. On April 7, 2013, Montego Airways Flight 828 took off from Jamaica, hit some turbulence and then landed in New York. The only problem? It’s actually five and a half years later. (I’m assuming Montego Airways is right next to Oceanic Air in the terminal). Ben (Josh Dallas), his terminally ill eight-year-old son, Cal (Jack Messina), and his sister, Michaela (Melissa Roxburgh), land to discover everyone thought they had died. Michaela’s fiancé, Jared (J.R. Ramirez), has moved on to another woman. Ben and Michaela’s mother has died. Their cell phones no longer work. They have no jobs. Michaela has no place to live. It’s a lot to take in, and no one has even told them Trump is president yet. “Funny how one little decision can ruin your whole life, but also save it,” Michaela says ominously. What happened on their flight is a mystery. The bigger problem is that both Ben and Michaela are hearing voices in their heads. On a bus, Michaela repeatedly hears “Go slower!” right before the bus driver narrowly misses hitting a small child darting out into the street. Ben is reluctant to talk about his newfound skill: “I don’t want to be a circus freak. I don’t have time for it.” In the end, Ben and Michaela’s voices lead to a crime being solved. So what will this show be? A standard cop drama with a mystical way of solving crimes? A series steeped in mythology as the mystery of Montego Airways Flight 828 is unraveled? I have no way of knowing, because NBC only made on episode available for review. Shows with complex premises need to provide more to be given a comprehensive review. The pilot alone was not enough to make me want to get on board. On the other hand, on Thursday ABC made two additional episodes of A Million Little Things available, and it didn’t exactly help the network’s cause. Eddie (Dave Giuntoli), Jon (Ron Livingston), Gary (James Roday), and Rome (Romany Malco) are four best friends who think they know everything about each other, until one afternoon Jon leaps from his office balcony to his death. (Fret not, I’m not spoiling anything. This is all revealed in the show’s opening moments.) Just as This is Us took nearly two seasons to explain how Jack died through flashbacks and interconnected stories, A Million Little Things asks why John killed himself. A business deal gone awry? An unhappy marriage? No one—not his wife, Delilah (Stephanie Szostak), nor his best friends—have any clue. Setting aside the problem of rooting your show in a mysterious suicide (which doesn’t feel quite right, given the epidemic of suicide and the recent headlines about celebrities who’ve taken their own lives), A Million Little Things doesn’t work because, dear Lord, are these people annoying. They are judgmental and nosy and seem to talk only in melodramatic phrases. “If any of you have delivering horrific news on your bucket list, take it off. It’s not as fun as you think,” Gary says. “Friendship isn’t a big thing. It’s a million little things,” Jon says in one flashback (title alert!). Jon, in particular, likes to talk in Hallmark card clichés: His oft-repeated phrase is “everything happens for a reason.” They also seem to have a lot of time to just be with each other. No one seems to have any other friends, work, or life obligations to prevent them from constantly hanging out. This is, of course, the willing suspension of disbelief that happens with all shows, but it’s extraordinarily grating here. All the guys have one big problem. Eddie is in an unhappy marriage to Katherine (Grace Park). Gary is in remission from breast cancer (“It’s a real thing,” he says to his support group). And Rome is struggling with crippling depression he’s told no one about. Gary is the funny one. Eddie the serious one. Rome the sensitive one. The one character we still don’t know much about is Jon, as three episodes in the show is still treating him as if he were a saint. It doesn’t exactly romanticize suicide, but it is still unsettling. I’ll be the first to tell you that This Is Us can be schmaltzy and emotionally manipulative. But the show works because of fully developed characters (for the most part), strong performances, and a good script. It’s the latter that’s missing here. There are a million other things you could be watching. Manifest premieres tonight at 10 p.m. on NBC. A Million Little Things premieres Wednesday, Sept. 26 at 10 p.m. on ABC.